These flame red butterflies have a wing span of a little over four centimetres, but they are nevertheless among the samller of our butterflies. The male and female of the large copper look slightly different. The basic colour of the wings is the same, but the wings of the male have darker scales only on the outer edges of the wings and in the zone nearest to the body (so in Arne’s photo we see ...?). The female butterfly’s wings have more dark scales on the upper side and in addition dark patches on fore- as well as hind wings, but the flame red is still visible. When the butterfly closes its wings the forewings show the bright basic colour and the hind wings are blue-grey flecked with black. Large coppers live in floodplains, marshy meadows, and on the banks of water bodies, where there is enough moisture. The caterpillars are known to feed on the water dock (Rumex hydrolaphatum) and we can find them during nearly the whole of July. 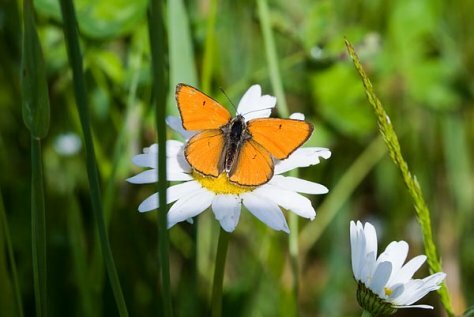 A protected species in Europe, and in Estonia too, found for the first time in Estonia some sixty years ago and has spread quite well since then.